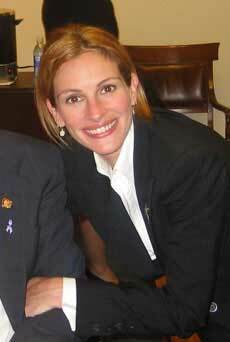 Julia Roberts is a name synonymous with successful Hollywood actresses. She is also one of the highest paid actresses of all times, but is very down to earth in real life. She has two siblings -- brother, Eric Anthony Roberts and sister, Lisa Roberts Gillan. Julia dreamt of becoming a veterinarian, but changed her mind to being an actress by following Lisa’s footsteps which landed her in the New York City. Then, it was brother, Eric who recommended Julia to director, Eric Masterson for his movie called Blood Red. Julia got to star in the film which was eventually released in the year 1989 and marked the beginning of her successful career. Eric Roberts is a known American actor who started off his career with a movie called The King of the Gypsies in 1978, which earned him the nomination in the best actor debut category in the prestigious Golden Globe Awards. He again landed up with another nomination, this time both in the Golden Globe as well as in the coveted Oscar Award in the category of best supporting role for his performance in Runaway Train in the year 1985. He also appeared in television series like Less Than Perfect and Heroes. Lisa Roberts is also a Hollywood actress, though not as famous or successful as her younger sister, Julia. She has roles in movies like I Love Trouble in 1994, Something to Talk About, a year later, Runaway Bride, in 1999, Maid in Manhattan in 2002, Monalisa Smile and Raising Helen in 2003 and 2004 respectively. She was also the producer of the movie called Nothing to Lose (1997), where she also did a cameo. What Is Julia Roberts Ethnic Background ? Julia Roberts is one of the most talented and successful actresses of the Hollywood industry. She was born on 28th October, 1967 in Atlanta, Georgia. Her family comprises of her now-divorced parents, father, Walter Grady Roberts and mother, Betty Lou Bredemus. Julia’s dad was a salesman of vacuum cleaners, writer of Scottish, Welsh and Irish extractions as well as an actor. Her mother was also an actress and worked as a church secretary too. Walter was of an English-Scottish descent from his mother’s side, while Betty Lou was Minneapolis-born. More..